This is the second of Maulfrid's patterns that I have knit as part of a Knit Along with the American Girls Knitting group on Ravelry. I loved making this pattern with a group of other knitters where we could all assist each other and could admire the various colorways each person had chosen. Some people chose their child's favorite colors, others emulated Maulfrid's original choice, I chose to use a traditional colorway of black, red, and white. Each year I make and donate 20 to 30 knitting and sewn garments for 18" dolls provided by a local chapter of a national charitable organization. The doll clothing I make will adorn dolls in a Christmas Toy Shop organized by the charity. Parents who might not have been able to provide holiday gifts for their children are allowed to choose a doll and additional clothing for their daughter. My hope is to produce clothing that makes children dream of a larger life than they may be experiencing now. I feel that Maulfrid's marvelously detailed and exceptionally beautiful patterns help me to reach that goal. Penny - You are the greatest. This is the most beautiful interpretation of the ski outfit I have seen yet (not that everybody else's weren't also great too!). Not only are you a great knitter and seamstress, but you are a great mentor too. Thanks for all your help and advice. I love your outfit! It is just so exquisite! You did such a lovely job on it. That is so wonderful of you to knit up outfits for little girls that need an outfit for their doll. 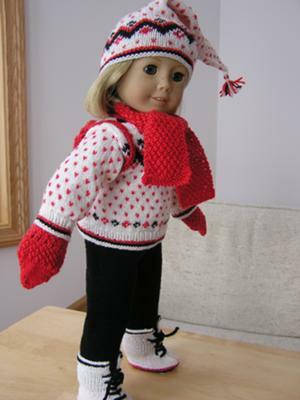 Any little girl would love a knitted outfit that you have made. I love to hear stories like this! So nice to hear about charity projects! It is very much needed in our world today! Kit looks fabulous in this awesome outfit! I really love the color combination you have chosen. Your support is greatly appreciated in our Ravelry group--thank you for your "you-can-do-it!" positive attitude! Thank you for sharing this beautiful outfit with us, and thank you for all you do for children! Your helpful hints and advice have been very helpful on our Knit a Longs on Ravelry, your generous spirit shines in your gifts to children and your help to all of us who started out as strangers but quickly became friends in cyber-land!